For trustworthy and reliable GPS tracked leaflet distribution in Oxfordshire, Shareplan Leaflet distribution can offer you a complete service, from conception to completion. Oxfordshire is home to the well know University of Oxford and Oxford University Press, which is one of the biggest print and publishing firms. The area also has a lucrative tourist industry and many biotechnology businesses. Shareplan Leaflet Distribution is a company of experienced direct marketing professionals, offering cost-effective leaflet distribution services throughout Oxfordshire and the Home Counties. The Oxford Times talks about the effective use of leaflet distribution and its importance to the success of any business. The main centre of population is the city of Oxford and it is one of the most visited cities in the United Kingdom for international visitors. Shareplan Leaflet Distribution in Oxfordshire operates a highly robust system of carefully monitored flyers delivery providing a quality service. 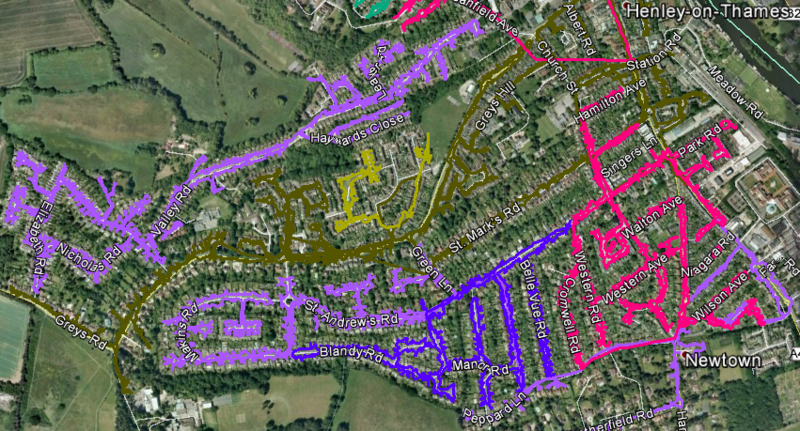 All our Oxfordshire door-to-door flyer distribution is GPS tracked. You will be supplied with a report when the flyer distribution has been completed. It only takes a moment to download the data and you can view the exact route that the leaflet delivery person took to deliver your leaflets. The image above is an example of our efficient and guaranteed GPS tracked flyer distribution. Our geotargeting service ensures you are delivering to the right target audience. You can give us a town name in Oxfordshire, for example Henley, and we will simply provide a report and map showing the number of residential deliverable properties. 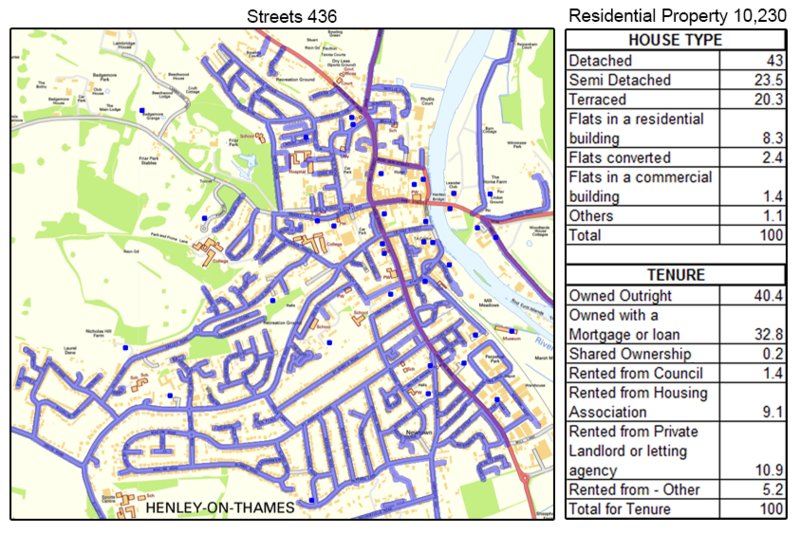 Henley-on-Thames is one of the few locations where 86.75% of the residential build is houses. A generous 73.34% of the people own the house either through a mortgage, outright purchase or a shared ownership as seen in the above image. The town’s prosperity goes back to the 12th century as river trade developed because of the town’s position. Henley-on-Thames is a sought after location for an affluent business clientage. You can also receive a free one-to-one consultation which gives you the chance to speak to one of our in-house marketing experts. Additionally, our Shareplan Leaflet Distribution service wouldn’t be complete without the chance to get an amazing deal on your printing. Shareplan Leaflet Distribution offers a reduced cost on your Oxfordshire flyer delivery when you order both your print and door-to-door delivery together from us! Our Shareplan Leaflet Delivery service attracts a repeat business rate of approximately 80%. We are so confident about our exemplary service that we offer a money back guarantee. We shall give you a refund on the proportion of leaflets we can’t prove the GPS tracks. Click the link to get your free quote now! Our Oxfordshire door-to-door delivery is available in all the main towns including Abingdon, Banbury, Bicester, Chipping Norton, Didcot, Goring, Henley-on-Thames, Oxford, Sonning Common, Thame, Wallingford, Wantage and Witney. Please feel free to take a look at our other coverage areas and also visit our FAQ if you have any other unanswered questions.